I am not really into musical films and have sort of graduated from watching adaptations of fairy tales both on TV and film (e.g. Once Upon A Time, Brothers Grimm) but I still gave Into The Woods a shot. I do not regret watching it but, of course, I got what I was expecting to get afterwards. I have a pretty solid record in watching musical films in movie theaters after a hard day’s work: I tend to sleep if the story’s not that strong to keep me truly interested until the end. Re: Into The Woods, let’s just say that the music is okay and all but the story wasn’t that great to keep me up and invested for the long haul. To give credit to where credit is due, the movie did succeed in the acting department. The actors who have shared their talents in the movie were all good. Led by Oscar-winning actress Meryl Streep who embodied the witch that cursed her neighbor’s unborn child (the baker) because of stealing from her magical garden, the cast got not just the singing chops to sing their pieces but also such natural acting that definitely helped build up the story. Anna Kendrick, despite my doubt about her tackling the Cinderella role, proved her versatility with this movie. Emily Blunt, which doesn’t really ring a bell every time I hear her name was pleasantly great as the baker’s wife. The baker, portrayed by James Corden, was good it was like he was molded into his role. Meanwhile, Chris Pine surprised everyone not because he looked well as Prince Charming but because he could sing! I also liked how remarkable were the young actors who portrayed Jack (from Jack and the Beanstalk) and Little Red Riding Hood. I heard people say that the movie did a lot of changes from the musical by Stephen Sondheim and James Lapine in which it was based. They said that some songs were pulled out and some details left out. In fairness to Lapine, the movie’s writer, what’s important to me as part of the audience who’s not aware of the musical where it was based was that the story was cohesive and easy to understand. 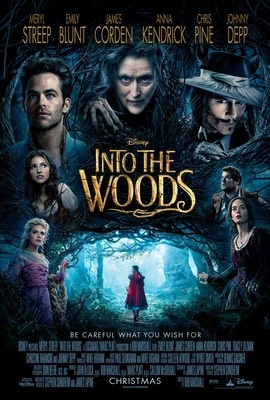 It’s amazing how the movie’s able to weave the stories of Cinderella, Rapunzel, Jack and the Beanstalk and Little Red Riding Hood by using one elephant in the room among fairy tales: the woods. However, I find the movie really just a so-so. I didn’t expect something really spectacular and that’s what I got, nothing spectacular. Unlike Streep’s first venture into musicals via Mamma Mia, this movie fell flat after striking it really well during the first half. The music also seemed repetitive after a while and the plot seemed to have lost touch after a pseudo-happy ever after ending. If you like Streep, Kendrick or Pine singing in charming roles, go ahead and watch his film. If you happen to like musicals, then it’s a plus. Just don’t expect too much, okay?